The long trek to Kangchenjunga North and South base camps takes about 4 weeks and passes through some of the most impressive landscapes of Nepal. It is often listed as one of the top treks in the world but because of its remoteness and the length of time it takes to get there, very few people attempt it and you will hardly find any other trekkers on your route. In 4 weeks of trekking in November 2004 (this is pretty much the peak trekking season in this part of Nepal) I met about 40 other trekkers. 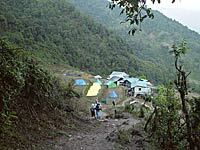 An additional difficulty is that because there is no lodge infrastructure (and no villages in the higher parts of the trek) the Nepalese government doesn't allow individuals to go on this trek. It has to be done with a team of porters and guides or, at least, it has to be organized by an official agency. Once you have your permit you could probably do it with only one or two porters doubling up as guides and cook. 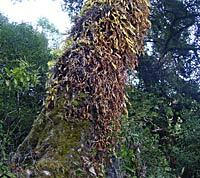 The easiest approach is to take a plane from Kathmandu to Biratnagar then to Sukethar in far eastern Nepal. The bus alternative from Kathmandu would take at least 3 days (especially in 2004 where night travel was not possible because of trouble with the Maoist guerilla). After landing on the short Sukethar airstrip (2490m) we meet our crew, gather our equipment and set off to Lali Karka. 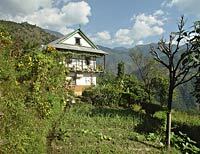 It is only a short walk away through forest and rolling hills. In fact, the next few days will all be through similar landscape. What one of our guide used to call undulating and meant that every day we could expect several long ascents followed by long descents. 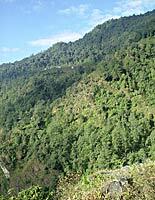 Eastern Nepal is close to the Bay of Bengal and there is little to block the rain between the huge barrier of the Kangchenjunga range and the sea. 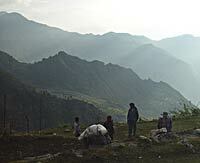 So it rains a lot and makes the region fertile and relatively wealthy (by Nepalese standards). Day 2 - Lali Karka to Shinchewa is a long descent followed by a steep ascent. Note some really nice houses, well kept and cared for. The area is not very densely populated but there are a fair number of houses spread around.